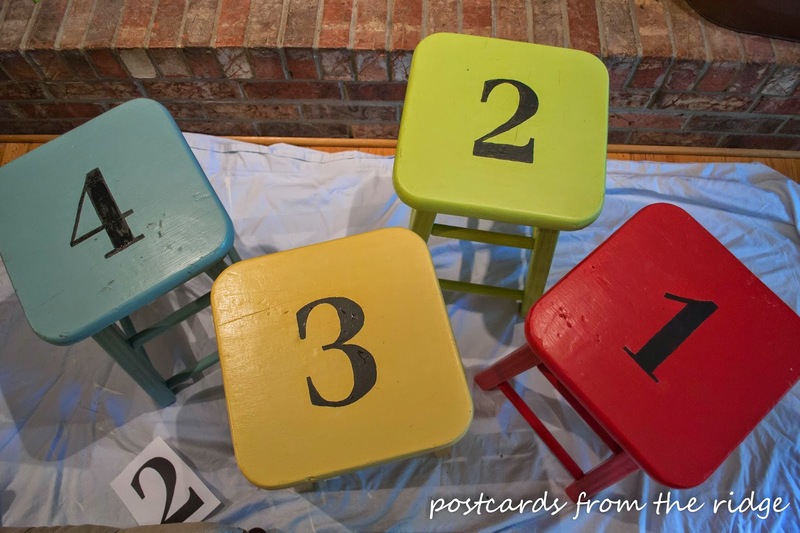 Today I'm joining forces with a few of my friends and revealing furniture makeovers that involve numbers. You'll definitely want to drop by and see all of the awesome projects we've completed. 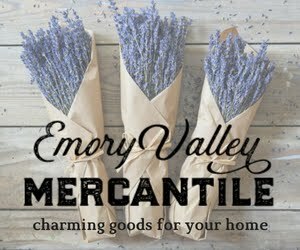 I've got a really fun, extremely easy project to share with you. 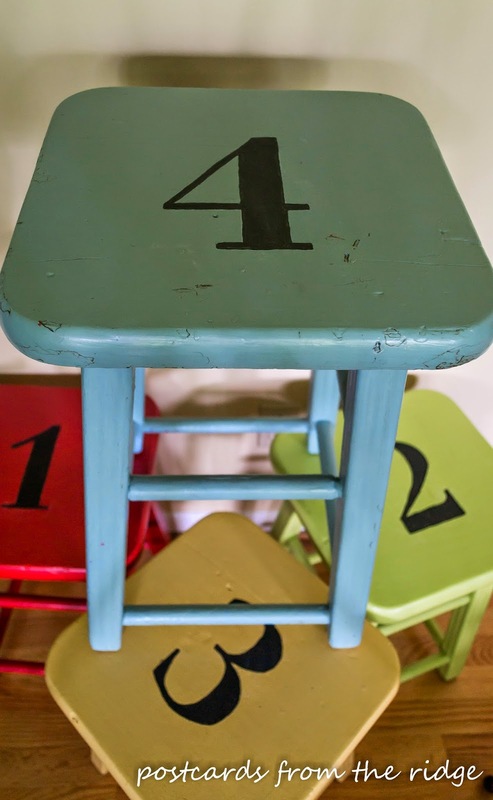 I've had these wooden stools for a while now and had painted them in these vibrant colors. They were cute, but needed a little something more. I added simple numbers to the seats and now they're super fun. And the process was much easier than you might think. Read on for the details. For starters, I had already painted them in colors that I adore. So the hard part (it really wasn't very hard at all) was already done! For this project, the most difficult thing was deciding on which font to use for the numbers! When I got the stools 2 were 70's green and 2 were cotton candy pink. Needless to say, they got a paint makeover after I gave them a good cleaning with my my favorite pre-paint cleaner. It makes sanding a thing of the past. And I usually don't have to use primer. Just a fresh coat of paint is all it takes. 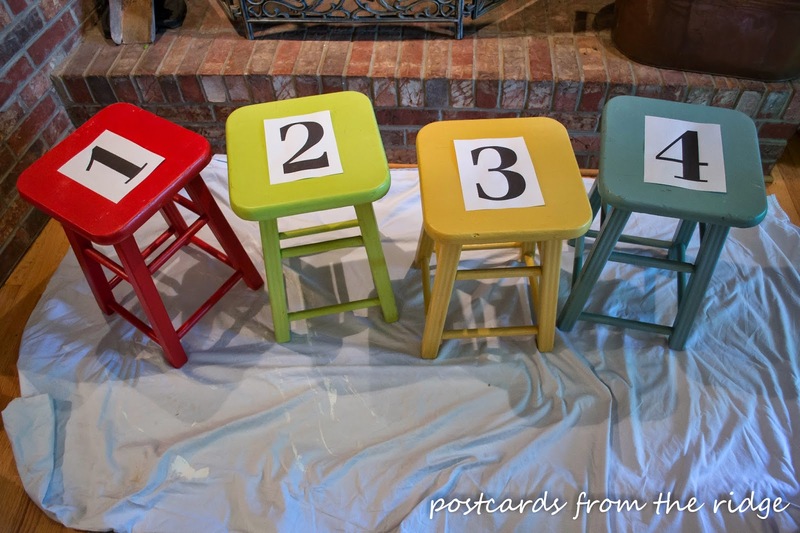 Next, I painted the stools in 4 fun colors and then finished them with a coat of Minwax Special Dark Wax. They stayed this way for several months. The stools are so handy! I've used them as accent tables like in the photo above (bonus points for anyone who finds the photobomber). And they're great to have for whenever we have extra teenagers over for lunch or dinner...which is pretty often. My original plans for the stools involved numbering each one, and I recently finished that part of the project. 1. 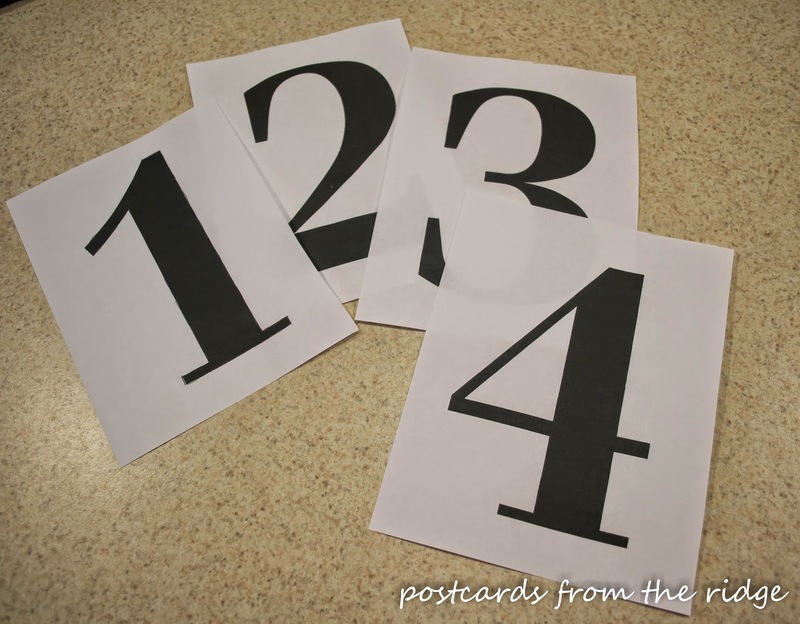 Choose the font that you want to use and print out the numbers, making them approximately 5" tall, or whatever size you prefer. 2. 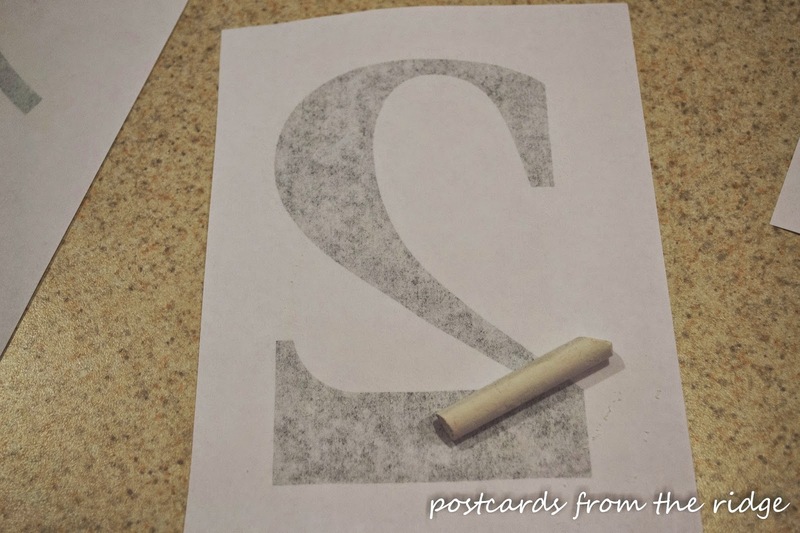 Trim the excess paper off the edges, flip them over, and rub white chalk on the back of the numbered pages. 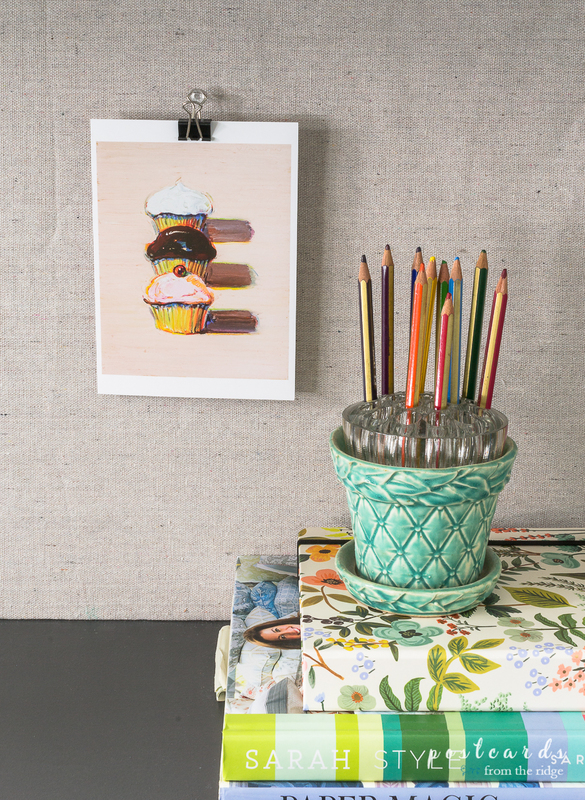 Note: if you'll be painting onto a light color, use a darker color of chalk so it will show up. 3. Position the numbers where you want them to be painted, and use an ink pen or pencil to trace around the outer edge of the numbers. It's not necessary to bear down very hard. And you might want to use something like Frog Tape for delicate surfaces to hold the pages in place without damaging the existing paint. 4. Remove the pages and this is what you'll see. Now, using artist brushes, paint inside the chalked lines with the color you want your numbers/letters to be. After the paint dries, you're done! Easy as pie. This project took me less than an hour. It wouldn't have taken that long if I hadn't had such a hard time deciding on a font. There are so many to choose from! 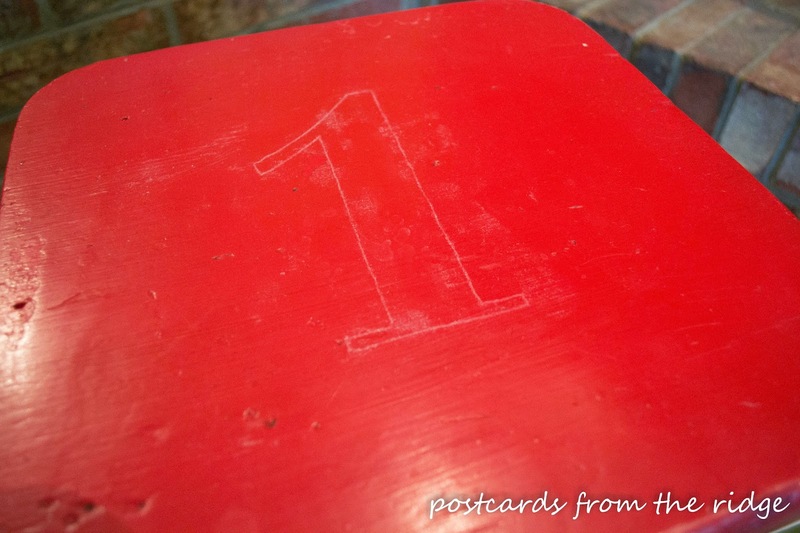 Note: you might want to add a clear sealer or coat of wax to protect the numbers and keep them from wearing off if the piece will be used for seating. Here they are, all lined up in our living room. They look like they're ready to go back to school. You can see the "character" that came with the stools in the form of several layers of old paint. That's exactly the way I like it. They'll be used thoughout the house, two as accent tables in the basement recreation area; one will be in the laundry room; and I'll probably keep one in the kitchen. What do you think? 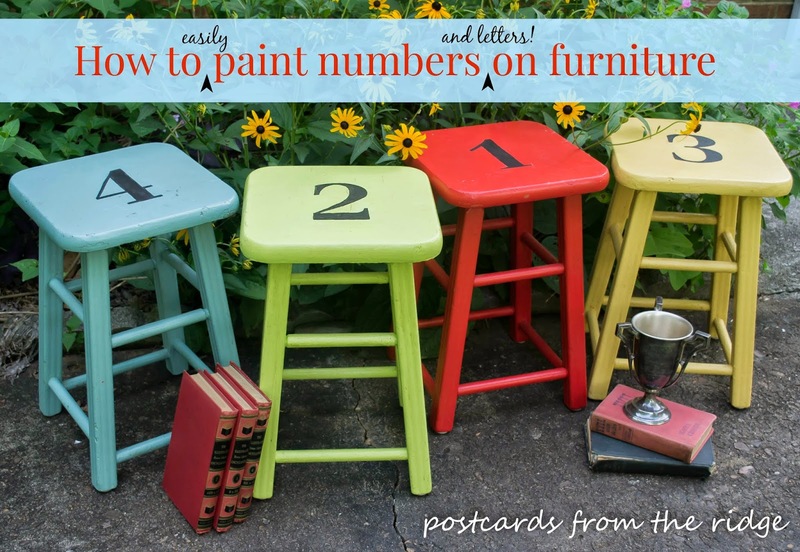 Is it worth an hour of your time to add some numbers or letters to something you've got lying around the house? If I can do this, you can! 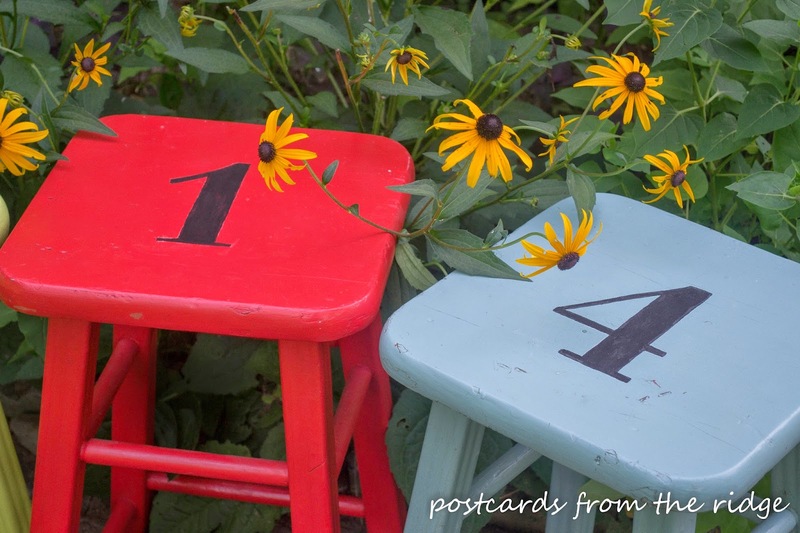 Be sure to visit all of my friends who are also sharing numbered furniture projects today, and tell them I sent you. 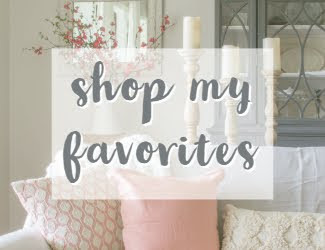 You'll love all of them! 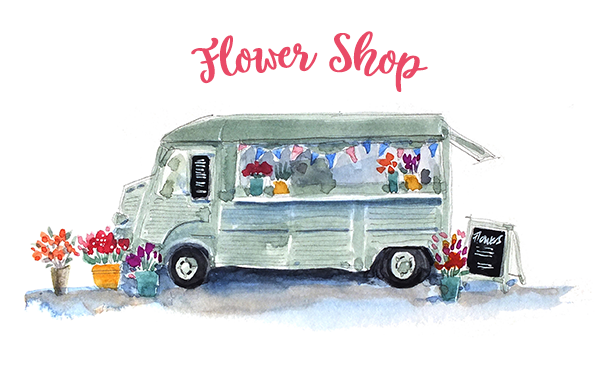 To see my complete gallery of painted projects, go here. For other handy tips and tutorials, go here. 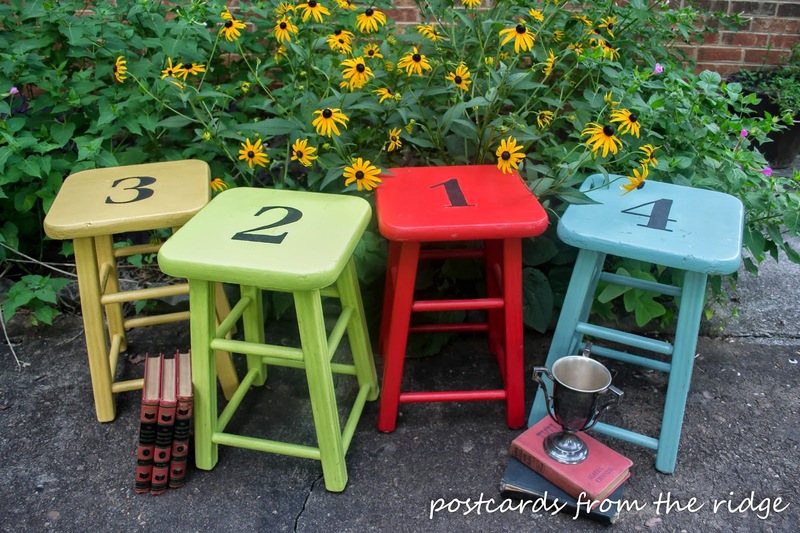 Love the fun colors you used for your stools and the numbers are the perfect final touch. Thanks for the Krud Kutter tip. I need to look for that product the next time I'm shopping. These came out adorable! Love the colors and font you used on these! Thanks Dria! It was a really fun project! 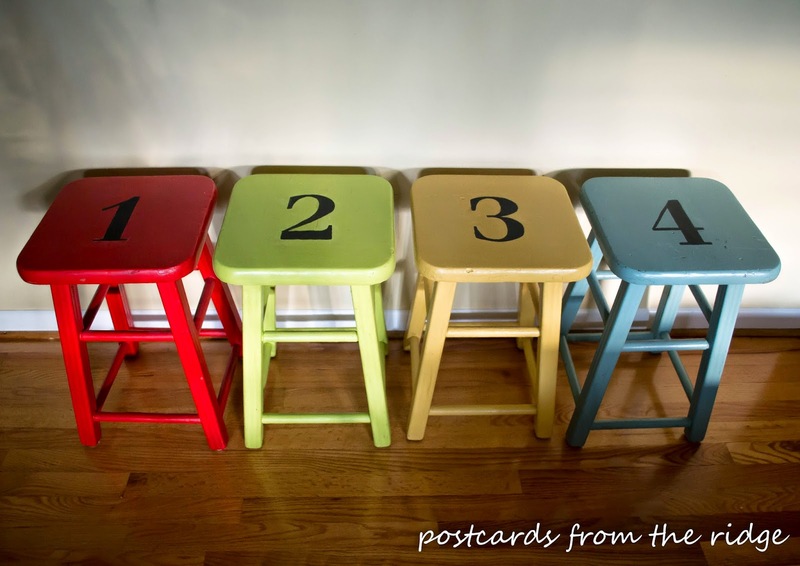 Your stools are such cute colors, and I love the numbers! Thanks, Christy! I had fun working on these! Thank you, Jeanette! I don't know why, but things really do look better with numbers, don't they? Great to be on tour with you too! And little photobombers are the best! These turned out super cute Angies! So bright and cheerful! Thanks, Shanna! They're definitely fun little stools! These are super cute Angie! I love the fun colors and the font you chose for the numbers. If you are interested in adding a few cutting boards to your shop, let me know. I would even custom make for you.